The King label was founded in 1943 by Sydney Nathan in Cincinnati, Ohio. The first releases were all country but in August 1945 Nathan formed the Queen label, devoted to black artists. In 1947 the label was discontinued and all new releases came out on King. Most, maybe all Queen releases were re-released on King with the same numbers. Nathan officially acquired the DeLuxe label in February, 1951, and formed Federal in late 1950. The budget label Audio Lab was formed in 1958. Queen 4140, 4141 and 4142 were also in Queen album #1; Queen 4154, 4155 and 4156 also in Queen album #3. Album #2 is by Mrs. Sidney Raush (secular). King 4298 (Famous Blue Jay Singers) was first issued on 20th Century 2047. King 5584 was reissued as #6386 (Reverend Abraham Swanson). King 6369 (Four Internes) is a reissue of Federal 12097 (1952). King 6370 (Patterson Singers) reissues two Federal recordings; “Jesus Knows” from Federal 12419 and “Try Jesus” from Federal 12427 (both Federal releases are from 1961). King 6371 (Spirit of Memphis) reissues two earlier King recordings; “Days Passed And Gone” (King 4340, 1949) and “Toll The Bell Easy” (King 4575, 1952). “This Old World” by Kay Robinson (King 6362) was first issued on Federal 12550 (also on Federal 12553, both 1967). The flip of King 6362, “Amazing Grace”, was a new recording, done with the Charles Fold Singers (1971). King 6316 (Kay Robinson) features part 1 of “Lord Will Make A Way Somehow”. According to the Gospel Discography, part 2 was recorded but never released. However, on YouTube King 004 (a bootleg 45rpm release from 2006) can be found, featuring the song with a song length of 5:15 minutes, so apparently both parts are there. The reverse of this side 45 is by Wendy Lynn though (see Discogs). It’s a bit confusing; either King 004 features both parts on one side (and the label information is wrong), or the recording on YouTube comes from another source. King LP 105-35 and 265-75 are 10inch releases. King LP 265-75 has been reissued as LP 395-519 (1956) and LP 519 (1958), both with four extra tracks. The 10inch album was also reissued on King EP’s 232 and 233. The four extra LP tracks were also on EP 234. Other EP’s with King material (Swan Silvertones, Spirit of Memphis) were released on Audio Lab. King LP’s 572-578 (“Spirituals”, vol. 1-7), probably with the exception of #574 and 578, have been reissued in 1960. Same numbers but different covers. King LP 572 has also been reissued as LP 939, King LP 573 has also been reissued as LP 942, King LP 574 has been reissued as LP 945, King LP 575 has also been reissued as LP 948, King LP 576 has also been reissued as LP 951, King LP 577 has also been reissued as LP 954, King LP 578 has been reissued as LP 957 and King LP 736 has been reissued as LP 1121. The Marvin Anderson Singers (King 6230, LP 1056) were formed from the (Gospel) Lords of Harmony (Savoy). King LP’s 1153 (Harrison Gospel Singers) and 1154 (Gales of Joy) probably exist as test pressings only, although LP 1153 was reissued as HSE LP 1451 with a different song order and some differences in song length. The Harrison Singers featured Rev. “Squeaky” Morgan, who may be the same person as Rev. Morgan on Savoy 4035 (as the Sons of David) and Regent LP 6070 (with Rev. Cromwell). See the Regent and Savoy discographies. Several LP’s were reissued on Gusto (c. 1974 and later), but these are not included in the LP discography. 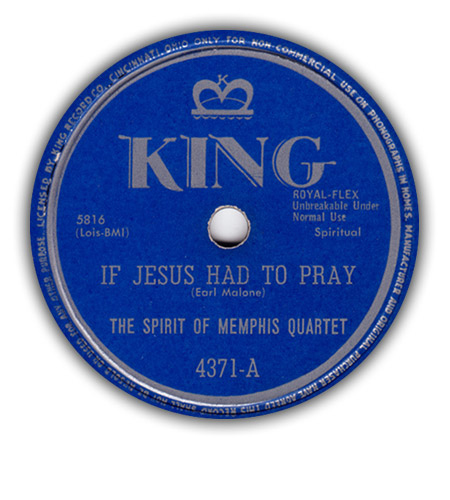 This page lists all known King & Queen gospel singles, EP’s and LP’s from 1946-73. 1 King EP 232 Wings over Jordan Wings over Jordan Choir no title 195? 2 King EP 233 Wings over Jordan Wings over Jordan Choir no title 195? 3 King EP 234 Wings over Jordan Wings over Jordan Choir no title 195? 1 King LP 105-35 Harmonaires Spirituals 1952?